Create a design that represents the character of the congregation and incorporates the three traditional symbols. You might hold a congregational contest. Purchase a candle made of at least 51% beeswax. Cover it completely with vertical strips of masking tape and use carbon paper to transfer your design to the tape. Choose one color of the design at a time and carve only that section one-eighth inch deep. Melt spare wax and color it with bits of crayon. Then paint this wax into the carved-out space. When the colored wax is cool, scrape it with a knife until it is flush with the candle surface. Repeat steps 3-5 for each section of color in the design. Then carefully remove the masking tape. 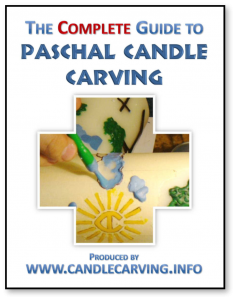 We’ve put together this printable booklet with step-by-step instructions, materials, tips, and other resources to help you create and care for your own custom paschal candle. Does this process look too difficult? See if any artists in your congregation might be interested in trying . . .
Use the Contact Page to inquire about the possibility of commissioning a candle by an experienced carver. Or check out the wide variety of designs offered by the candle manufacturers listed on our links page. The practice and technique taught through this website was originally developed by student staff at Valparaiso University. Students have made a new paschal candle for The Chapel of the Resurrection every year since 2002. Instrumental to developing the technique were Liv Larson, Jakob Rinderknecht, Luke Smetters, Michael Kern, and Steven Wilco. Learn more about the Chapel of the Resurrection.